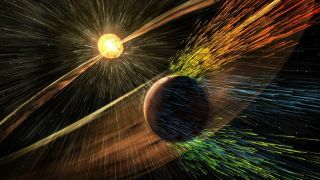 Artist’s illustration of a solar storm hitting Mars and stripping ions from the planet's upper atmosphere. The sun stripped away most of Mars' atmosphere billions of years ago, "Star Trek" is coming back to TV and the search for signs of intelligent life around a strangely dimming star has come up empty so far. Here are Space.com's top stories of the week. Has dark matter always been dark? Have astronomers found evidence of advanced aliens? Should rovers explore wet areas on Mars? Follow us @Spacedotcom, Facebook or Google+. Originally published on Space.com.